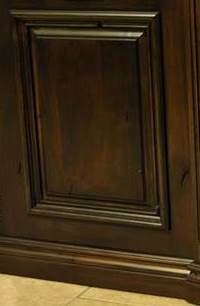 Question, trying to figure out an effective method for installing wainscot with the rabbeted panel molding, rail/stile method, but my question is how to attach a raised panel to the center. I had done some in the past this way, and just brad nailed the RP in the center to the panel molding, preassembled the panel molding, nailed it to the RP and inserted the whole thing as one unit into the recessed area inside the rails/stiles. however, on one of them I noticed, with winter upon us, that the RP tried to shrink, but with the nails holding it, it couldn't expand/contract, so the RP split in the middle. I thought I could just fasten the panel molding to the center of the RP on top/bottom so it has room to expand/contract, but doens't seem like that would hold everything together very well. Anyone have a better method? Or is this how you do it to avoid the expansion problems? i always keep 1/4 inch cork on hand for centering panels. We do this with mortise and tenon stile and rail assemblies that have plows for the raised panels. Assemble everything ,floating the panels if they are solids, and then miter the molding and then ad it to the frame by nailing. Do nail to the panel. We also have done it by molding a plow into the panel mold, mitering it around the raised panel, reinforcing the miters, and then adding that into the stile and rail assemblies. Thank you both. I had thought of using 1/4" stock of some kind as a way to hold and center the panel behind the panel molding. David- I also like the idea of adding a plow to the rail/stile to accept the panel and the panel molding. I don't think the panel molding profiles I have access to will lend itself rabbeting the front/bottom part of the molding without getting too far into the profile itself. I'll have to see what other profiles my supplier has that might work that way as well. Also, at the end of your first paragraph, you said you nailed the molding to the frame and then added "Do nail to the panel." I'm assuming you meant "Don't nail to the panel" but wanted to clarify. thanks to both of you. Gives me a few more ideas to think about/play with. PS - David- those are beautiful pictures by the way. Seeing work like that is what continually motivates me to improve and why I love this trade so much. Trevor - Let me correct myself. It should read "Do not nail...." Never a good idea to nail/glue solid wood panels floating in a frame. I like to assemble the mitered molding frame with glue and pins, and even screws (after glue has set) to reinforce the miter before it goes into the flat frame. Miters will not stay tight over the years - they are often the first thing that lets go over time. We also reinforce with splines. Some folks use a Hoffman dovetail key - that is a great way to keep miter where you want them. I am a poor typist, and when I multi-task, it gets worse. Then I forgot to proof read..... Thanks for the compliment. I realized I don't have any decent photos of that work that is flat. Those panels were fun - for a circular bar. We use the Hoffmann keys for miters like that. Fast and hold really well. If possible use two keys per miter. I had to do the first floor of a 4000sq/ft house with similar wainscotting. I used the cabinet door set to do 1/2" t & g joints. The units were assembled with raised panels pinned top and bot. The joints of the units were pocket screwed. All of the moulding were applied after the fact with a 23 gauge pinner and glue. I second what Larry says. The Hoffmann dovetail is quick, easy and strong for this type work.